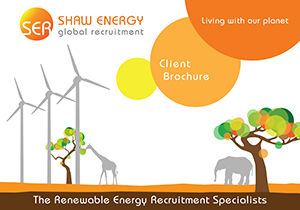 Shaw Energy renewable energy recruitment has an unequalled success ratio for sourcing the most talented permanent staff for companies around the world. Renewable energy recruitment is our passion. With our worldwide consultants, extensive experience in all renewable energy staffing sectors and our commitment to understanding your business, SER is an invaluable asset for all your renewable energy project staffing needs. SER business ethos is that every renewable energy staffing project is your unique staffing project. We take the time to look at each project afresh and take a bespoke managed approach to ensure we always provide a successful and tailored solution. We pool all our resources, from our database search and social media resources, to our vast amount of contacts within all renewable energy jobs sectors to ensure we find the candidate that fits like a glove within your company for years to come. We take full advantage of social media in the marketplace. With over 10.000 renewable energy professionals on our Linked-In groups and our ever expanding innovation with social media, we are always developing our networks. Our online network increases our visibility and brand reputation and allows us to reach even more of the best talent for you.